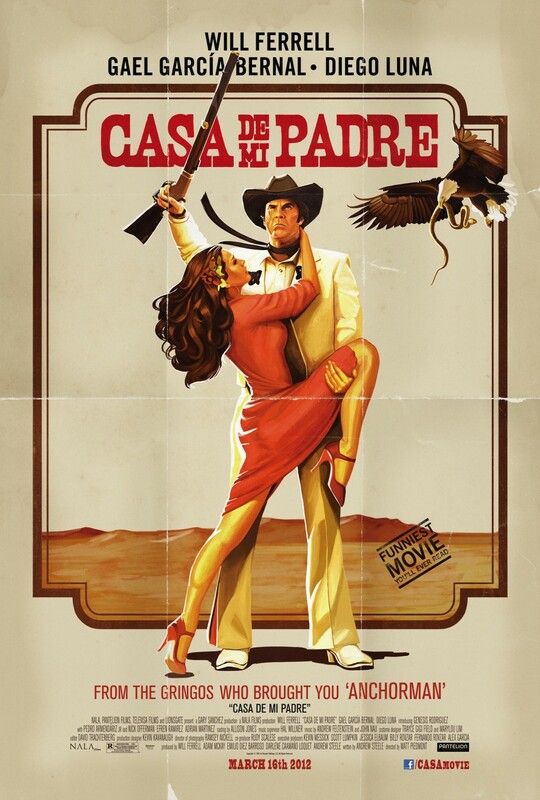 The plot of Casa de mi Padre is standard action/melodrama: brother of hero comes home to the ranch with hot girlfriend, brother turns out to be bad news, hot girlfriend not-so-secretly falls in love with hero, brother gets in trouble with very bad dude who lives nearby, hot girlfriend somehow mixed up in everything, hero has to save the day, hero does save the day. You've seen this movie before, or at least something not too different from it. It may not have come from Mexico, but from India, the United States, Turkey or Indonesia, but trust me--if you've seen B-movies, you know this plot. And Offerman/Swanson, playing a corrupt DEA agent who speaks perfect Spanish but with the most cringe-worthy American accent you can imagine, is a certified scene stealer. In the end, though, the film is neither brilliant nor really even aiming for that. Instead, it's a quieter type of spoof film: perfect to catch midway through on a lazy Sunday afternoon, but not exactly something you'd run out and get the Blu-ray special edition of. Bonuses: +1 for taking the more subtle approach to spoofing; +1 for Nick Offerman, who is awesome; +1 for the rest of the stellar cast, who all look like they were having a blast making this film. Penalties: -1 for just not being that good, at the end of the day. Read about our Pitchfork-inspired, non-inflated grading system here.